Quite the most breathtaking Gothic skirt we have ever seen! 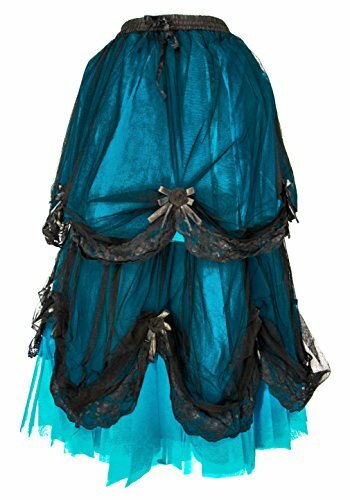 The underskirt is made from soft blue satin with stiffened black net tulle over the top, then swags of ultra soft fine mesh edged with lace and decorated with organza roses and black satin ribbon. Over this is a layer of mesh which is edged in 3" wide black lace and gathered up at intervals to form deep scalloped drapes. Stiffened net forms the lower hem. Blue tulle lined bottom. The skirt has an elasticated waistband with a ribbon drawstring. This skirt is designed to be worn fairly wide hence the amount of stiffened tulle to hold the shape. Would be perfect as part of a Gothic bridal outfit and would look gorgeous with a tight fitting corset to accentuate the shape of the skirt. This skirt has an elastic waistband as well as a satin cord to cinch in and out the waist. Please read measurements carefully!